Adventurous people who are up for challenging outdoor sports and incredible fun in the water can opt for the Intex Challenger K1 Kayak. This is one of the sportiest kayaks which will not only afford you a striking water traverse but also will make it easier and comfortable. To people who are going to think over purchasing a kayak in these days, we present you the details of this product along with the positive and negative aspects for your expediency. This Intex Challenger K1 Kayak is made of high quality welded materials. It’s cockpit which is designed for comfort and large space. This kayak has aluminum oar of 84 Inch, manual hand pump, and repair patch. It is only for one person inflatable kayak but Its durability and flexibility will provide you with extra comfort on the lake or river. This kayak has some features like easy to store and transport, more stable, enough storage room and a dry bag with your extras. It pumps up quickly about 6 minutes for K1. This Intex Challenger K1 is designed for adventurous people. The super eye-catching graphics added for high visibility. For lakes and the mild river, it has low-profile. This kayak has inflatable I-beam floor for rigidity and comfort. It has removable skeg for directional stability. It’s grab line made of Ruged vinyl on both ends. This kayak has a cargo net which is used for extra storage inflatable seat with backrest. It’s cockpit designed for comfort and space. It's super fast to inflate and deflate. This Intex Explorer K2 kayak is one of the most durable kayaks which is sporty and fun design for easy paddling. To make the kayak highly visible in the water, added bright yellow color and sporty graphics. This kayak is perfect for two persons. It is the best kayak for experiencing lakes and rivers with a friend. This sturdy kayak made with rugged vinyl construction and it has inflatable I-beam floor for comfort and space. For directional stability, It is included a removable skeg. It inflates and deflates quickly. The Intex Explorer K2 kayak provides accessories like two 86’’ aluminum oars and an Intext high output pump for easy inflation. 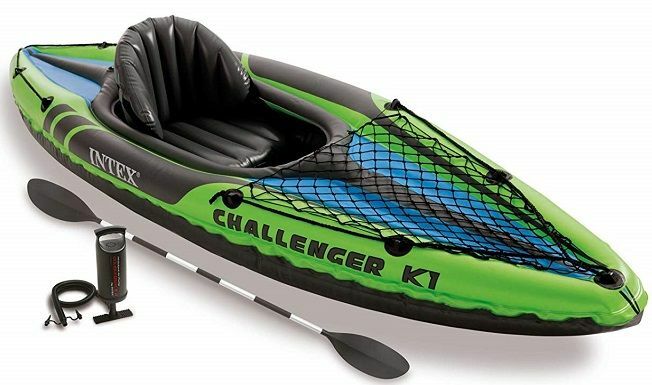 This Challenger K1 kayak is specially designed for the modern angler. It has sporty graphics which is great for high visibility and super design for easy paddling. This kayak has some features including Ruged vinyl construction, Grab line on both ends and cargo net for extra storage. For comfort and rigidity, Inflatable I-beam floor included. Its inflated size is 9' x 2'6" x 1'1" (274cm x 76cm x33cm) and 1 person – 220 lb capacity. 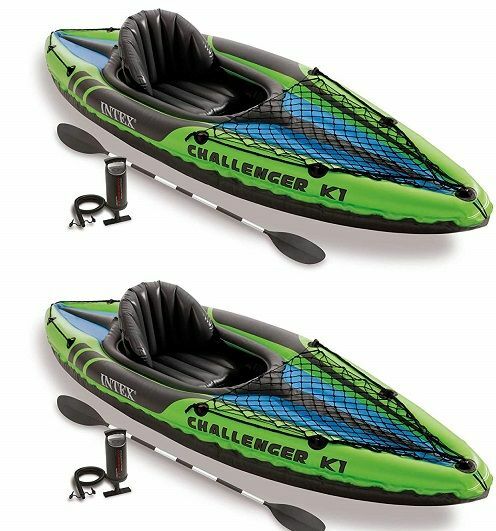 This Intex Challenger K2 kayak is designed for two persons that inflate very quickly. It provides convenient and comfortable watercraft for paddling. This kayak made with durable UV-resistant vinyl. For exploring lakes and flat water rivers, the kayak’s has high buoyancy side chambers. It provides great stability and tracking due to the removable skeg. There are two adjustable inflatable seats added with kayakers paddle for comfort and space. There are three high-pressure drop stitch panels for the I-beam floor which support up to 400 lbs. This kayak has the ability to survive any state of affairs that occurs during the water rides. This is because it is made of hard-wearing welded bits and pieces that provide a long lasting life to this kayak. Not only durable but the kayak is also nimble and is very quick I actions. When you are riding a kayak, it is very important that the kayak can move fast or can act swiftly according to your direction and this is where this K1 Kayak goes perfectly. Fast and smooth, that’s all we can about this. When you are in the Challenger K1 Kayak, you are out of harm’s way! Yes! This kayak is superior about safeguarding you from any harm in the way. When you are on the lake or slow-moving river, you surely need to take extra precautions for saving yourself from sudden misfortune and this is where K1 Kayak by Intex leads you to an accurate way for being safe and sound and enjoy your journey to the fullest. The Challenger K1 Kayak has an attention-grabbing graphics for making you do your venture in a luxurious way. The cockpit of the kayak is designed for maximized space and proper comfort. The inflatable I-beam floor of the kayak adds stability to the device so that it does not move so much. When you are doing an outdoor water sport on a kayak with your family or friends, it is imperative for you to take food and other goods for a long voyage. For storing extra gear, this Kayak has cargo net. This K1 Kayak has grab line on both ends of the kayak. It has inflatable seats which include backrest for proper comfort. This kayak by Intex comes with the aluminum oar of 84 inches along with repair patch. The attachments also include hi-productive manual hand pump. The measurement of the Kayak is 30 (w) by 15 (h) by 108 (d) inches and the weight of the kayak is 27.2 pounds. What are the available colors of Challenger k1 Kayak? 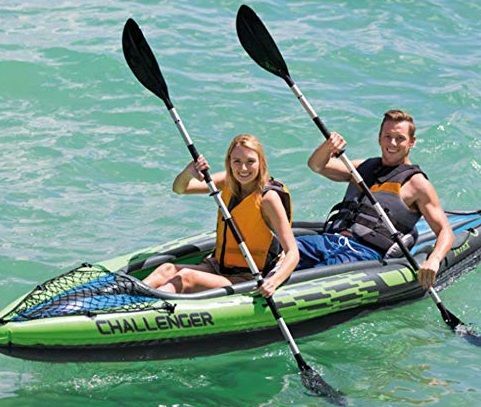 The Intex Challenger Kayak is available in bright green, grey and black. Whatever suits your personality; you can go for that color. How much weight can Challenger k1 Kayak bear? How many paddlers can paddle the Challenger k1 Kayak? 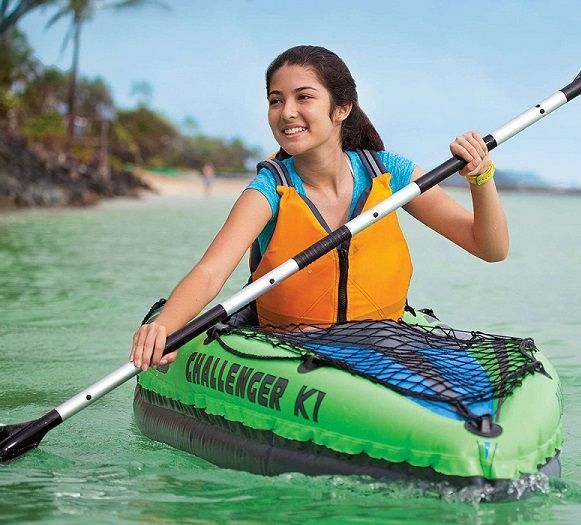 The Challenger k1 Kayak by Intex is not a tandem kayak so it cannot bear 2 paddlers or 3 paddlers. This kayak is made for one paddler so if you want a journey all alone then you can select this. If you want a journey with your seasoned friends then you can buy more than one kayak and have fun kayaking as a competition. The term “Kayaks should only be of solid plastic” is wiped away by this Challenger k1 Kayak. This kayak made storage a breeze! The kayak is compact and all you have to do it folding it back or rolling it to store it. Anyone of any age can live it because it is lightweight. This kayak is constructed by Vinyl PVC. So, are you ready to go for a water ride? Fishing is more fun with this Challenger K1 Kayak. Trying to purchase a fishing kayak? Know the details form us! We provide you with the best information is such a precise way that you can decide promptly yet accurately.